Irving, Texas — Fluor Corporation announced that Bridging North America, a partnership of Fluor, ACS Infrastructure Canada and Aecon Group Inc., reached financial close to design, build, finance, operate and maintain the Gordie Howe International Bridge Project for Windsor-Detroit Bridge Authority (WDBA). Fluor plans to book its share of the design and construction contract value in the third quarter of 2018. Fluor is participating in the entire 36-year life cycle of the project, which will be delivered under a $4.4 billion design, build, finance, operate and maintain contract. Fluor brings robust public-private partnership (P3) experience and industry-leading ability to successfully finance and manage complex megaprojects. The project includes approximately $900 million of financing in a combination of bonds, bank debt, and equity from Fluor and its partners. The contract includes milestone payments for design and construction progress, as well as availability payments for operating and maintaining the project over the concession period. 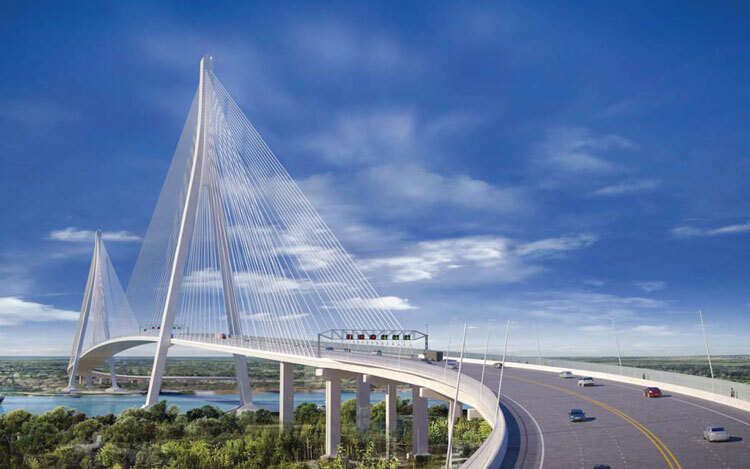 “Fluor is pleased to have reached financial close on the Gordie Howe International Bridge project. We are honored to partner with WDBA to build prosperity and empower progress for the Windsor-Detroit region,” said Terence Easton, president of Fluor’s infrastructure business. The Gordie Howe International Bridge project is a planned bridge and border crossing spanning the Detroit River and connecting Detroit and Windsor, Ontario, Canada by linking Interstate 75 and Interstate 96 in Michigan with the new extension of Highway 401 (Rt. Hon. Herb Gray Parkway) in Ontario. Fluor, ACS Infrastructure Canada and Aecon Group Inc., partners in Bridging North America, led the development phase of the project and will hold the prime contract. This is the second project in the Windsor-Detroit area where Fluor and ACS Infrastructure Canada have partnered. They recently delivered, and are currently maintaining, the Rt. Hon. Herb Gray Parkway in Windsor, Ontario, that will connect to the Gordie Howe International Bridge. The partnership will design and build the project, and when complete, the crossing will be the longest cable-stayed bridge in North America. The scope also includes building new, state-of-the-art ports of entry on both the U.S. and Canadian sides of the Detroit River as well as improvements to existing infrastructure in both Michigan and Ontario. Once completed in 2024, Fluor, ACS Infrastructure Canada and Aecon Group Inc., will operate and maintain the facility for 30 years to performance standards established by WDBA. Previous ArticleMott MacDonald selected for pier rehabilitation in Mobile, Ala.